Nail blogs are a great source of nail art ideas, but sometimes it can be difficult to understand what's what with all the specialized terms used, so we've put together a glossary of nail art terminology to help you get the best of nail art wisdom. Color blocking means creating a design from solid blocks of color. 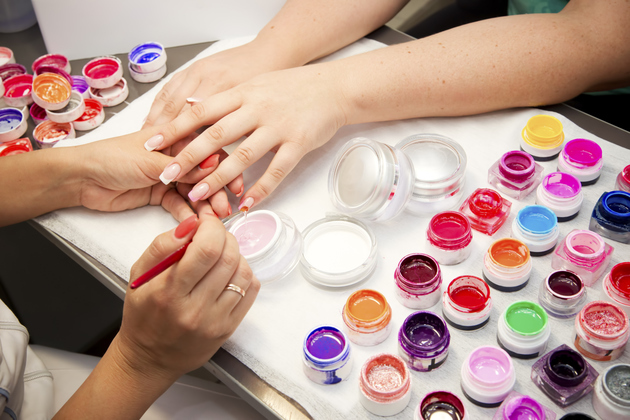 As a nail art term, it means applying multiple, distinct sections of color to a single nail. This can be done by painting a stripe of a distinct color to one side of the nail, across or down the middle. A very useful addition to the list of nail art terms, dabbing (a.k.a. 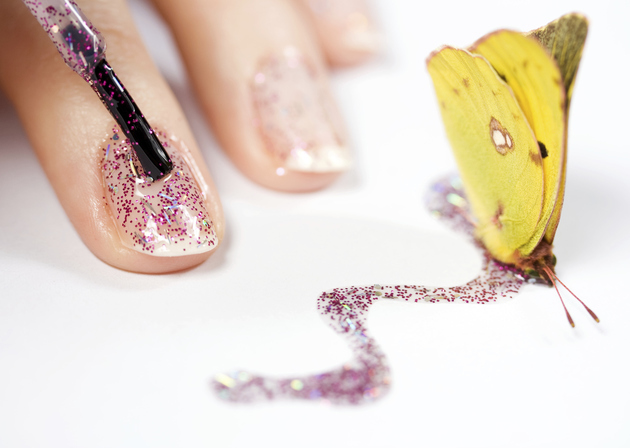 longbrushing) refers to a way of applying tricky glitter polishes, using a dabbing motion and the entire length of the brush to leave a stripe of glitter behind. These are distinct terms, but there is some overlap, mainly between gradient and ombre, which can give rise to confusion. A gradient manicure achieves a transition from one color to another down the length of the nail. This can be done by applying the two polishes with a cosmetic sponge and manually blending them into each other. Ombre merges shades of a single color, usually going from a lighter to a darker shade. This can be done as a gradient (blending smoothly down the nail), but is often done from nail to nail. Skittle is a nail art slang for a manicure where each nail is painted a different color, in a striking, random mix of colors, like a selection of Skittles candies. Franken (both a noun and a verb) is a nail art slang that refers to the process, or the product, of blending polishes to create a new shade. As a nail art slang, ruffian refers to a style of manicure which incorporates two (or more) colors. The first shade is applied the normal way. The second shade is laid on over it, starting a bit further away from the base so that a thin portion of the original color remains visible. Saran wrap is a nail art slang for a manicure technique that requires two or more polishes and a few wads of saran wrap or cling film. It can be done as a reductive or additive process. For a reductive manicure, paint your base shade and wait for your nail polish to dry. Then, working one nail at a time, paint your second shade on top. Before it has time to dry, make some saran wrap into a ball and press it over the wet polish, then pull it away. It will pull away with it bits of the top polish, creating a marbled/textured effect. As a nail art slang, stamp refers to a technique which uses special stamping plates and polishes, allowing you to stamp pre-designed images on your nails. Konad is the best known creator/distributor of nail stamping kits, providing a generous amount of polishes and plates in a vast array of prints. Tape manicure is a nail art slang designating a technique in which Scotch tape is applied to a section of the nail you don't intend to paint on. This technique can be used for color blocking or to create a lightning bolt design. You can also use proper nail art striping tape, which is very narrow, to create thinner stripes and designs. As a nail art slang, water marbling refers to a technique in which you drip two or more shades of polish into water to create a design. You then dip the nail into the water so that the swirled polish clings to the nail, transferring the design. Watercolor is a nail art technique in which you paint the nails in multiple colors, which fade and blend into each other to resemble a watercolor painting. One of the methods to do this is by applying the first polish in dots, then dipping a brush into acetone to thin and spread the color, repeating the process with several polishes until colors blend across the nail. You can also thin out the polish with a bit of acetone before application to make it easily “blendable”.